Stay close to Florence and still enjoy the atmosphere of the Tuscany countryside! The Settignano Suites offer two elegantly furnished accommodations within walking distance of a small and picturesque village. The units (Settignano 1, 6 guests and Settignano 2, 6 guests) can be rented together for a group up to 12 guests. 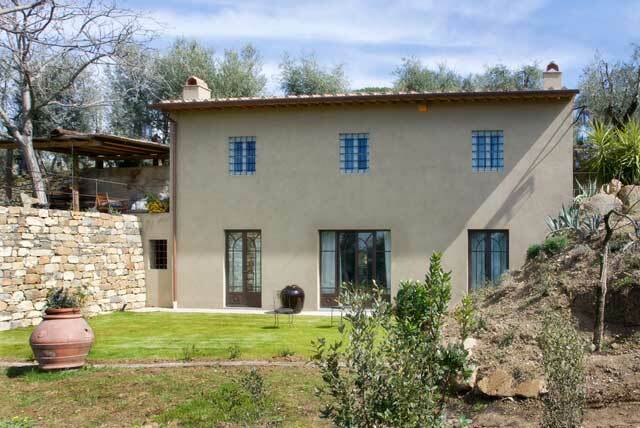 If rented together, they provide a comfortable and hospitable experience of Tuscany. Special note: Settignano 2 can be rented with exclusive use of the full property if it is rented for three weeks or more and Settignano 1 is not booked. The estate is well landscaped with flowers, herbs and vegetables, lovingly tended by a gardener. Settignano Suites is a non-smoking property. Pets are not accepted. Included in the price are daily maid service Monday through Saturday, heating, final cleaning, Internet WiFi connection. Bath linen is changed on Tuesday and Saturday, bed linen on Saturday. Pool towels are included A cell phone is available with a prepaid card. An extra bed is not available. Black and White Suite: Queen/twin beds (180cm x 200cm), en suite bathroom with large shower and bath tub, walk-in closet. Wisteria Suite: Queen/twin beds (170cm x 200cm), safe box, en suite bathroom with large shower, walk-in closet. Amenities include central heating, air conditioning, satellite TV, refrigerator, wireless high speed Internet access, washing machine, dishwasher, private outdoor area, fireplace, safe box and mobile phone with rechargeable card. Upon request: Extra maid service, laundry service, cook service. Pool open: Approximate dates May 20 to September 15, 2016 depending upon the weather. Size: 14m x 7m, depth 1.55m; Pool towels are included.